The equation to find the quantity of combinations of CSEGs that do NOT include 'redundant CSEGs is represented by the expression: y(n) = n!, whereas n represents the cardinal number. 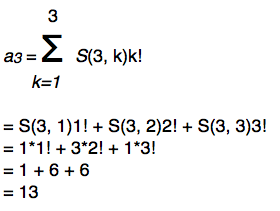 The symbol, ‡, shows that the set can be 'reduced' and/or 'normalized' to another CSEG set. A few of the websites that I ran across containing information on this series kept bringing up the following 'horse race' thought experiment: In how many ways, counting ties, can horses cross a finish line? ^a ^b ^c I considered comparing my mathematical contour-set problem with the horse race puzzle. Is it the same problem? YES! Imagine that we have two horses named Horse A and Horse B that set out on a race. There are three possible outcomes: They tie for first place <00>, Horse A wins while Horse B comes in second place <01>, and the third outcome, Horse B wins while Horse A comes in second place <10>. We wouldn't say Horse A and Horse B tied for second place <11>. Rather, we would 'reduce' the sets by deducting '1' as I have demonstrated with the contour sets so that '0' is the lowest number. Likewise, if we had three horses—Horse A, Horse B, and Horse C—there would be thirteen possible outcomes. Just as in contour theory, situations such as set <202> would never occur in the horse race outcome because that would be like saying "Horse B won first place, while Horse A and Horse C tied for third place." In the same way that I 'normalized' the contours that didn't use up all the values between 0 and the highest value in the set, horse race judges would 'truncate' the middle value and give both Horse A and Horse C the benefit of the doubt by awarding them both second place rather than the third place medal. The equation to find the quantity of sets given the cardinal number turns out to be much more complicated than I expected! I must take this opportunity to give Travis Richardson, my roommate, credit for working this out. The first process is to create a triangular array using the equation called the "sterling numbers of the second kind." The 'S' in the equation signifies that we need to look up those coordinates on the table. When those numbers are plugged in, it produces the series we're looking for. After crunching through all of these numbers, I discovered Robert Morris’s article, “New Directions in the Theory and Analysis of Musical Contour.”^9 I realized that Dr. Morris had already worked out these equations including the Stirling Numbers of the Second Kind and the Ordered Bell Numbers, and then some. Thus, this entire footnote could actually be replaced by a single citation of Robert Morris's article; however, I am choosing to show my work anyway. I think that my path to finding this equation is just about as exciting as the statistical contours of Berg's Clarinet piece. Although it is a little disappointing to go through all this work only to find that it was completed by a brilliant music theorist nineteen years ago, I must admit that I am not ashamed of having independently stumbled upon the same conclusions as Robert Morris.